Earthquake is a phenomenon in nature which tends to cluster in some parts of the world. Globally, several million earthquakes are estimated to have occurred every year. Many of these hit remote areas or may be too small in magnitude to be appreciated. 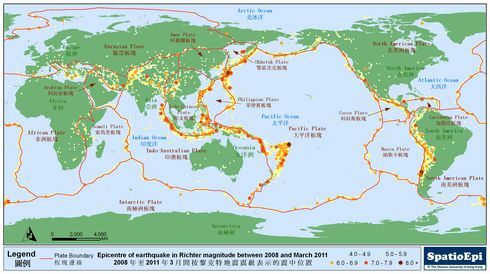 The map shows the distribution of earthquakes of magnitude 4.0 or higher on the Richter scale detected between 2008 and March 2011. As indicated by coloured dots, most earthquakes occurred along the boundaries of plates. Referred as "Pacific Ring of Fire", the lands encircling Pacific Ocean are zones of frequent earthquakes and volcanic eruptions. The exact time and epicentre of earthquakes cannot be easily predicted. To protect lives and reduce damages, it is crucial to enhance understanding of earthquake risks, improve engineering design and uphold preparedness. Data for the map were obtained from U.S. Geological Survey (USGS) and Environmental System Research Institute (ESRI). Earthquake is usually caused by a sudden slip on a fault, resulting in ground shaking and release of seismic energy. Fire, landslide and tsunami are common hazards following an earthquake. Apart from casualties, outbreaks of infectious disease can be a public health concern after earthquakes. Damaged sanitation facilities may increase gastrointestinal infections. Respiratory infections may occur in crowded shelters. Transportation of medication may also be disrupted because of the damaged roads or railways. To prepare for an earthquake, a post-earthquake gathering place should be available. Members of the public should be able to locate the nearest fire and police stations as well as emergency medical facilities. Some emergency supplies such as food, liquids and shoes must be kept at home and work place. In case of fire or gas leak, locations of fire extinguishers and the main shutoff switch for gas, electric and water supplies must be known well in advance.